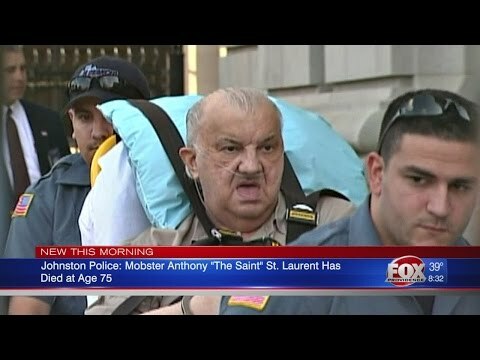 In the annals of local mobsters, Anthony M. "The Saint" St. Laurent might best be remembered as the wiseguy whose legendary ailments never stopped his healthy pursuit of crime. For decades the made member of the Patriarca crime family faced convictions for racketeering, bookmaking, drugs and assaults. And as he aged, his myriad of medical problems — congestive heart failure, back problems, chronic intestinal dysfunction to name a few — became topics of bail hearings. On Monday, Johnston Police Chief Richard Tamburini confirmed that St. Laurent, 75, died of natural causes less than two weeks after being released from federal prison after serving five years on a murder-for-hire charge. "There was nothing glamorous about the life of Anthony St. Laurent Sr. and his criminality," said Steven O’Donnell, the recently retired state police superintendent. Said Deputy Attorney General Gerald Coyne, who has prosecuted mobsters for years: "He was a career criminal who never changed his ways as he grew older." St. Laurent’s criminal record dates back as far as 1959. By the mid-1980s his felonious pursuits stretched from Providence to Atlantic City to Las Vegas. In 1990 he pleaded guilty to assault and conspiracy for trying to extort protection money from a Johnston restaurant owner. In 1993, authorities charged him with running the largest gambling ring ever uncovered in Rhode Island. That same year, the Nevada Gaming Commission banned him for life from Nevada casinos, citing St. Laurent’s 21 previous arrests and organized crime connections. In 1999 law enforcement agents arrested St. Laurent and a half-dozen other associates in an alleged mob extortion and gambling ring. During his bail hearing a defense lawyer outlined St. Laurent’s numerous medical problems in an attempt to gain him freedom, noting he had checked himself into some of the nation’s top medical centers over the years. Besides being overweight and having a history of abusing cocaine, he suffered from high cholesterol and was taking five different medications for high blood pressure, his lawyer said. St. Laurent’s physician testified "Mr. St. Laurent is probably the sickest man I take care of," …a potential "time bomb for a heart attack or stroke." There was even testimony that St. Laurent’s painful chronic bowel condition required daily doses of methadone and 40 enemas a day. The judge overseeing the hearing wasn’t persuaded: St. Laurent would be held without bail pending trial. St. Laurent was different from other mobsters, said O’Donnell, "in that he drew attention to himself, which was against the rules and was also very involved in drugs, which historically was taboo." Yet, said Coyne, "he was old school," too. "The crimes he committed were not the ones people talk about today like cybercrime. It was gambling, extortion, organized crime activity." In 2007, St. Laurent pleaded guilty to federal extortion charges and sentenced to five years. He spent his days in a wheelchair at the federal prison in Fort Devens talking about ways to take out his rival, Robert DeLuca, another made member. DeLuca had accused him publicly of being a government informant. When the FBI got wind of the plot, they sent in an undercover police officer who, posing as a prospective hit man, got St. Laurent to confide that he had offered money to a man to kill DeLuca. In 2011 St. Laurent, who became an FBI informant, admitted to the murder-for-hire scheme and was sentenced to seven years in prison. He appeared before the judge in a wheelchair.